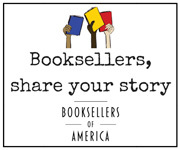 You met some great booksellers in your Bookseller Discussion Groups. Join them again for a self-guided exploration of your Wi14 educational experience. This capstone session will help you set achievable goals and create actionable steps for improving your business.